In a wedding, flowers celebrate, welcome, dote, cherish and laugh. In a relationship, flowers surprise, thank, charm, encourage and heal. We are overjoyed to create beautiful and meaningful flowers that you can keep well beyond your wedding day and into your long and happy marriage. 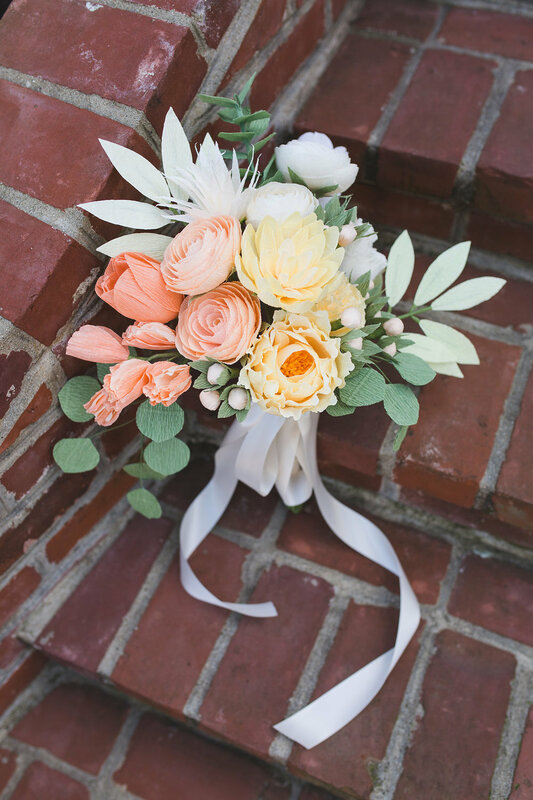 How can you incorporate paper flowers into your wedding? Unique and Authentic, Like You. Using crepe paper, we handcraft each flower one petal at a time, so no two blooms are exactly alike. You won't see us working with mass-produced, synthetic, or artificial greenery or other elements. And that's because we're not in the business of fake flowers, but rather, we believe in work that is authentic, intricate, unique, and made from scratch. Let's Start with a recipe and Tailor it to you. Our exquisite 20-stem bridal bouquet recipes can be ordered as-is, or they offer a helpful starting place for customizations. We are happy to work with you to add or subtract stems and substitute colors to customize a bouquet for you. Smaller versions of each can be recommended for bridesmaids and mothers. Bridal Collection photography by Burtch Photography, Fenwick Photo Arts, and Hanna Salonen Photography.